We’d love your help. 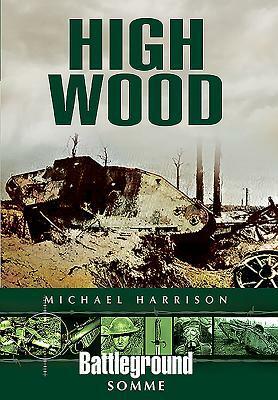 Let us know what’s wrong with this preview of High Wood by Michael Harrison. Bois de Fourcaux, a luxuriant woodland covering 75 acres, set in the area of the battlefields of the Somme, dominates the surrounding landscape today, as it did in the summer of the year 1916. Known to the British Army as 'High Wood', the invading Germans had occupied the wood as it proved to be a natural field fortification and a menace that had to be neutralized if the B Bois de Fourcaux, a luxuriant woodland covering 75 acres, set in the area of the battlefields of the Somme, dominates the surrounding landscape today, as it did in the summer of the year 1916. Known to the British Army as 'High Wood', the invading Germans had occupied the wood as it proved to be a natural field fortification and a menace that had to be neutralized if the British were to find a way forward in their attempts to breach the trench systems of the German Army and break out into the 'Green Fields Beyond'. This insightful publication will take the battlefield visitor, and also those who are unable to visit the site, on a journey through the history of the battles for High Wood and its environs. It covers the most significant dates in the British Army's struggle to eject the invader and the Germans determination to hold that which they considered to be their new National Frontier. This is the story of the largely amateur British Army of 1916. Lessons were learned in the roaring furnace of the Somme that would transform the fighting ability of the British irrevocably: High Wood was at the epicenter of that learning process. To ask other readers questions about High Wood, please sign up.